What’s the Big IDEA in Real Estate Marketing? 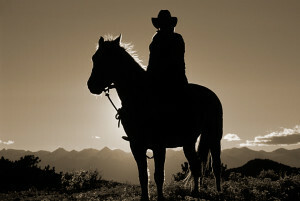 Why it’s OK to be a Cowboy – Sometimes. Yeah, I know. I am not a fan of Cowboy Marketing. Not “Cowboys” as in rodeos, big hats, boots and horses. But Cowboy as in the Wild Wild West, Ready-Shoot-Aim, just go for it variety. When it comes to marketing, strategy and planning is key. But sometimes – it’s OK to be a Marketing Cowboy. In the land of real estate, your highest and best use of time is to be face to face with clients, showing homes to buyers and going on listing appointments with sellers. And you have to do all of this while still building a pipeline of future business. What’s a busy real estate agent to do? You have a good idea. You have the delivery system to make that idea happen. But you don’t have the time to get everything “Just So” before pulling the trigger. So I say – go ahead. Pull the trigger. BUT only one one condition – that you come back to this piece of marketing and fix it as soon as you can. But if that’s just not in your budget right now – go ahead. Cowboy Up! Pull that trigger and then go off to get those buyers and sellers under contract. But then COME BACK! Either when you get a moment (yes, you’ll have to time block this task and put it on your calendar!) OR when you have your next closing and can make the financial commitment to hire a marketing pro to finish what you started. Either way, when it comes to Real Estate Marketing – just get er done. Sign up below for your weekly 5-minute marketing tip. action items you can do in minutes delivered directly to your inbox each week.